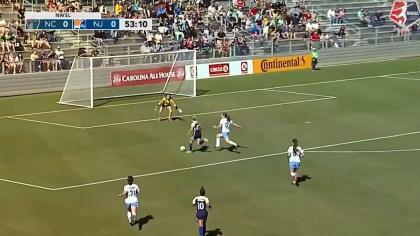 Lindsey Horan scored her first two goals of the NWSL season as Portland Thorns FC topped Sky Blue FC 2-0 on Saturday night in front of a crowd of 2,418 at Yurcak Field in Piscataway, New Jersey. Portland improved to 4-1-3 with 15 points and has not lost a game since April 22. Sky Blue FC fell to 4-4-1 with 13 points on the season. Thorns goalkeeper Adrianna Franch made six saves to earn the shutout, her fifth of the season, including stopping a Sarah Killion penalty kick attempt in the 56th minute. It was the first penalty kick miss of Killion’s NWSL career. She previously had been a perfect 8 for 8. The Thorns jumped out to an early lead thanks to a 20th minute goal from Horan. 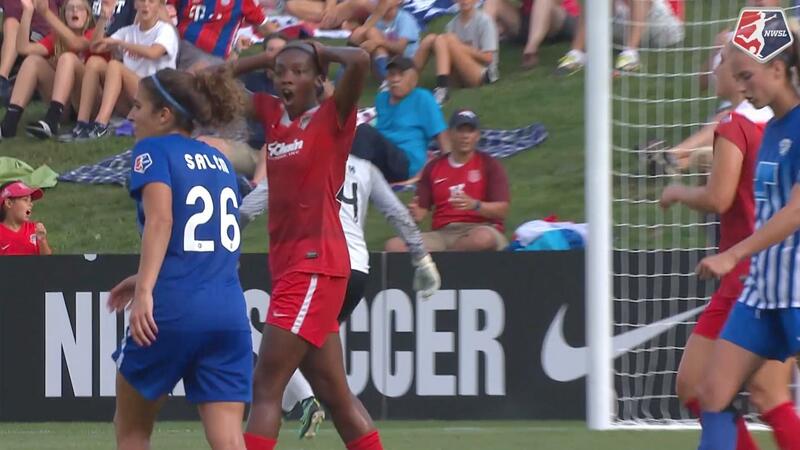 Sky Blue defender Kayla Mills fouled Portland forward Nadia Nadim near midfield, earning a yellow card. Nadim took the ensuing free kick, sending a long ball right to the head of Horan, who headed it past Sky Blue FC goalkeeper Kailen Sheridan to put the Thorns up 1-0. Horan doubled the score in the 42nd minute, sending a right-footed shot into the back of the net after defender Meghan Klingenberg whipped a pass into the box. Match ends, Sky Blue 0, Portland Thorns 2. Second Half ends, Sky Blue 0, Portland Thorns 2. Offside, Portland Thorns. Celeste Boureille tries a through ball, but Nadia Nadim is caught offside. Attempt saved. Raquel Rodríguez (Sky Blue) right footed shot from the right side of the box is saved in the top right corner. Assisted by Kelley O'Hara. Substitution, Portland Thorns. Kendall Johnson replaces Christine Sinclair. Attempt blocked. Daphne Corboz (Sky Blue) right footed shot from outside the box is blocked. Assisted by Leah Galton. Attempt blocked. Lindsey Horan (Portland Thorns) left footed shot from outside the box is blocked. Assisted by Nadia Nadim. Offside, Portland Thorns. Nadia Nadim tries a through ball, but Lindsey Horan is caught offside. Attempt saved. Raquel Rodríguez (Sky Blue) right footed shot from outside the box is saved in the bottom left corner. Assisted by Taylor Lytle. Attempt missed. Samantha Kerr (Sky Blue) right footed shot from the centre of the box is high and wide to the right. Assisted by Taylor Lytle with a cross. Substitution, Sky Blue. Daphne Corboz replaces Kayla Mills. Attempt missed. Kayla Mills (Sky Blue) left footed shot from outside the box is high and wide to the left following a set piece situation. Meghan Cox (Portland Thorns) is shown the yellow card for a bad foul. Attempt saved. McKenzie Meehan (Sky Blue) header from the centre of the box is saved in the top centre of the goal. Assisted by Samantha Kerr with a cross. Substitution, Portland Thorns. Dagny Brynjarsdottir replaces Mallory Weber. Substitution, Portland Thorns. Meghan Cox replaces Allie Long. Attempt missed. Raquel Rodríguez (Sky Blue) header from the centre of the box misses to the left. Assisted by Sarah Killion following a set piece situation. Christie Pearce (Sky Blue) wins a free kick in the attacking half. Attempt missed. Maya Hayes (Sky Blue) left footed shot from the centre of the box misses to the right. Assisted by Samantha Kerr with a headed pass. Penalty Sky Blue. Raquel Rodríguez draws a foul in the penalty area. Penalty conceded by Mallory Weber (Portland Thorns) after a foul in the penalty area. Attempt missed. Nadia Nadim (Portland Thorns) right footed shot from outside the box is high and wide to the left from a direct free kick. Attempt saved. Kelley O'Hara (Sky Blue) right footed shot from a difficult angle on the right is saved in the bottom left corner. Assisted by Madison Tiernan. Offside, Sky Blue. Samantha Kerr tries a through ball, but Taylor Lytle is caught offside. Second Half begins Sky Blue 0, Portland Thorns 2. First Half ends, Sky Blue 0, Portland Thorns 2. Attempt missed. Kailen Sheridan (Sky Blue) right footed shot from more than 35 yards is close, but misses the top right corner from a direct free kick. Attempt saved. Madison Tiernan (Sky Blue) header from the centre of the box is saved in the centre of the goal. Assisted by Sarah Killion. Attempt saved. Samantha Kerr (Sky Blue) right footed shot from a difficult angle on the right is saved in the bottom left corner. Assisted by Kelley O'Hara. Goal! Sky Blue 0, Portland Thorns 2. Lindsey Horan (Portland Thorns) right footed shot from the centre of the box to the high centre of the goal. Assisted by Meghan Klingenberg. Attempt missed. Samantha Kerr (Sky Blue) right footed shot from the right side of the box is close, but misses to the left. Assisted by Madison Tiernan. Attempt blocked. Allie Long (Portland Thorns) right footed shot from outside the box is blocked. Attempt missed. Taylor Lytle (Sky Blue) right footed shot from outside the box is high and wide to the left. Assisted by Kelley O'Hara. Attempt blocked. Raquel Rodríguez (Sky Blue) right footed shot from the centre of the box is blocked. Assisted by Samantha Kerr. Attempt blocked. Samantha Kerr (Sky Blue) right footed shot from outside the box is blocked. Assisted by Raquel Rodríguez. Goal! 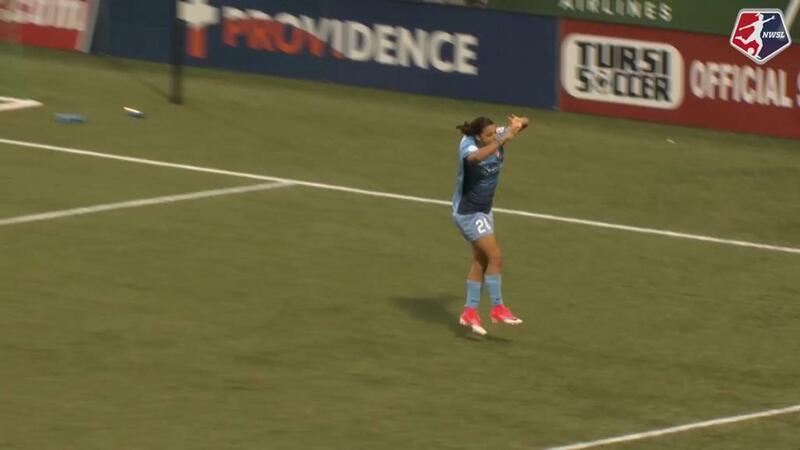 Sky Blue 0, Portland Thorns 1. Lindsey Horan (Portland Thorns) header from the centre of the box to the top right corner. Assisted by Nadia Nadim following a set piece situation. Kayla Mills (Sky Blue) is shown the yellow card for a bad foul. Attempt blocked. Christie Pearce (Sky Blue) right footed shot from the right side of the box is blocked. Assisted by Maya Hayes. Attempt saved. Mallory Weber (Portland Thorns) left footed shot from the centre of the box is saved in the bottom right corner. Assisted by Nadia Nadim. Attempt saved. Amandine Henry (Portland Thorns) left footed shot from outside the box is saved in the top centre of the goal. Assisted by Christine Sinclair.